1. Install Ubuntu 14.04.1 on the Cisco M-series server. 2. Run reboot test, OS will come up and go for graceful reboot continuously. 3. 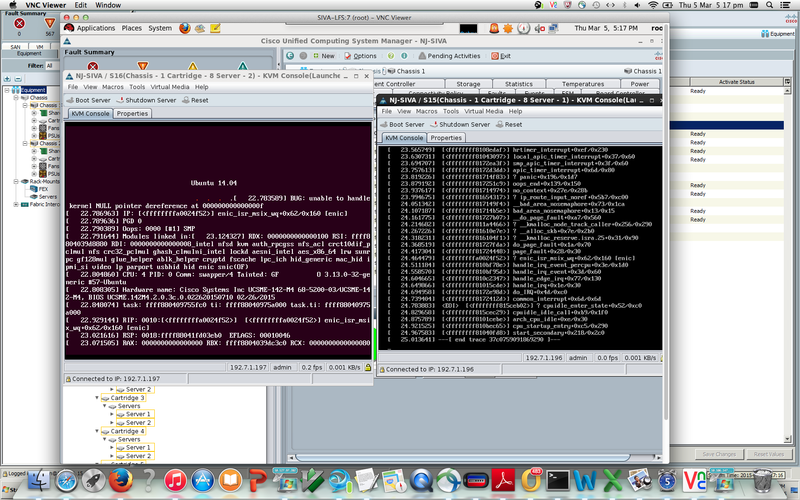 I am seeing kernel panic in 3 out of 4 Ubuntu machines . Don't know after how many iterations of reboot it happened. I checked the server 6 hours after starting the reboot test. 4. Don't know whether this panic is happening while the OS was booting or while going for reboot. The bug has been root caused to the enic driver and a fix has been posted upstream. Please find below the details of the patch submitted upstream. 4cfe878537cec0e9c0f84b93cc6aa9526f6942b5 enic: do tx cleanup in napi poll. This bug is submitted for the patch to be pulled in from upstream to Ubuntu's releases. I am unable to get the logs from the machine. BTW, the bug is already fixed and the patch is committed upstream. The details of which has been mentioned in the description. Any update on the patch being pulled? I'll try to build a test kernel with these commits, but it may be too many changes for an SRU.